The vertebrae are the bones that make up the spinal column, which surrounds and protects the spinal cord. 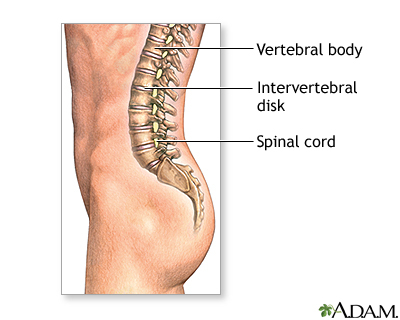 The intervertebral disks are soft tissues that sit between each vertebrae and act as cushions between vertebrae, and absorb energy while the spinal column flexes, extends, and twists. Nerves from the spinal cord exit the spinal column between each vertebra. Updated by: C. Benjamin Ma, MD, Professor, Chief, Sports Medicine and Shoulder Service, UCSF Department of Orthopaedic Surgery, San Francisco, CA. Also reviewed by David Zieve, MD, MHA, Medical Director, Brenda Conaway, Editorial Director, and the A.D.A.M. Editorial team.